The Gay Gamer: Surely there's space on my puny little desk for at least one of these Pikmin plushes, right? Surely there's space on my puny little desk for at least one of these Pikmin plushes, right? Don't worry, I'm not actually planning to buy any of the adorable plushes seen below--in part because the bulk of my gaming allowance for the rest of the year was accounted for long ago. That won't stop me from pining for one or more of them, though--especially the trio found along the bottom of the following photo. 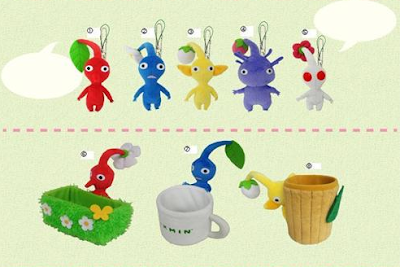 Although I think the Blue Pikmin clinging to the coffee mug is my favorite, the other two also are pretty cute. All were produced by Japanese toy manufacturer Sanei, by the way, and can be bought via importer NCSX (here) for between $13.90 and $23.90. I love plushies! I recently started collecting them, and have Bowser, Bowser Jr., Toon Link, Petey Piranha, and Tanooki Mario and Luigi. :) These look adorable! Wow, that's quite a collection, Phillip! I can't imagine I'll start collecting them myself, despite the fact that I really like them. I already have too much gaming stuff and not enough places to put all of it! I'm pretty much out of room (but that's because of games), and I only started collecting as I had some extra PayPal, but not quite enough to get games with. Those are ADORABLE!!! 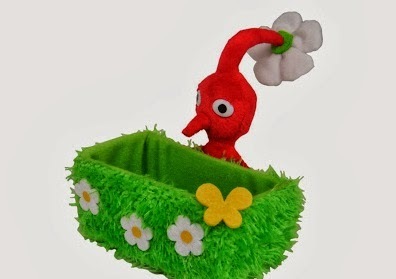 I love plushies and have more than a few of them but I would LOVE to have some Pikmin plushies. I want to hug those more than my Kirby plushie! Ah, that makes sense! For me, I could see picking up the odd one once in a while, to stick on the edge of my desk, etc., but that's about it. Damn you Bryan, damn you for making me want buy stuff. Ha ha! Sorry, Sam. Maybe you can just come here and stare at the photos rather than buy one? It's a garbage can! My gosh, Justin, I've been looking at this image for a few days now and I absolutely could not figure out what that last "accessory" was supposed to be. Thanks for figuring it out. Ha!